Perform the test at the normal operating atf temperature: 50 to 80°c (122 to 176°f). The line pressure test should always be performed with at least 2 people. One person should observe the condition of the wheels or wheel chocks while the other is performing the test. Be careful to prevent sst's hose from interfering with the exhaust pipe. This test must be performed after checking and adjusting the engine. When conducting the stall test, do not continue for more than 10 seconds. Remove the test plug on the transaxle case center right side and connect sst. Fully apply the parking brake and chock the 4 wheels. Start the engine and check the idling speed. Keep your left foot firmly on the brake pedal and move the shift lever to d.
Measure the line pressure when the engine is idling. Depress the accelerator pedal as much as possible with your right foot. 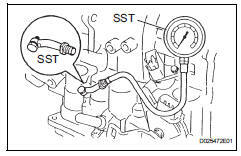 Quickly read the highest line pressure reading when the engine speed reaches stall speed. Perform the measure line pressure test again with the shift lever on r.